The 168 is the best all round skate for performance and fun - All in a skate that adjusts 4 sizes to grow with your feet. This gives you certainty in choosing the right size for now, knowing there will be room to grow in the future. These skates boast incredible features for the price, with an aluminum speed frame, comfortable soft boot design, ABEC 7 Speed Bearings AND 2 Crazy Skates illumin8 LED Light Up Wheels. These skates will keep you feeling great with the breathable comfort of a softboot and with the protective stability of our reinforced ankle cuff. Leaving you to enjoy the flashing fun of our illumin8 LED wheels as you run rings around your friends. 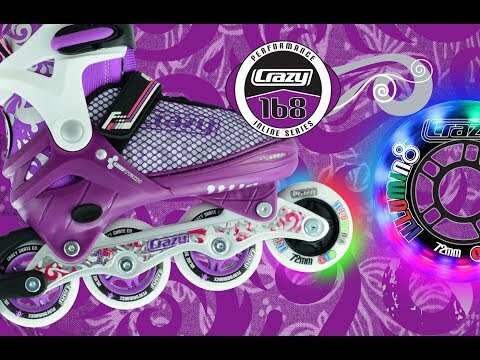 Perfectly suitable for both indoor and outdoor skating, look no further than the Crazy Skates 168 Inline.